Web applications and websites are all going Web 2.0. You too want to jump on the bandwagon, but do you have a Web 2.0 name for your product/company/domain name? If you are having hard time coming out with names Web 2.0 style, here’s a website that might give you a hand or two – Web 2.0 Name Generator. 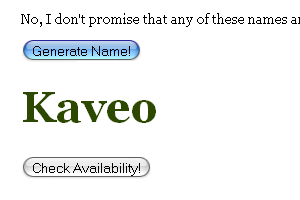 The generator does not promise you the name it randomly generates are definitely available, but it should be. They are also kind enough to provide a Check Availability button just in case you really want the generated name so badly. Grab yourself a Web 2.0 name with Web 2.0 Name Generator.